I said I’d have a brace of Ardmores this week but let’s make it three in a row. This one is the most useless review of the lot, being an independent release that came out well before yesterday’s Traditional and Friday’s Archives 20 yo. I don’t think I’d even heard of the distillery when this was released. Like the Archives this is from a bourbon cask, though it’s a fair bit younger. My sample came to me from Ardmore-enthusiast, Michael Kravitz (his review is here). I don’t have any Ardmore patter left after the last two reviews and so let’s get right to it. My whisky reviews have been flirting with relevance this month. I’ve reviewed widely available official releases (Cragganmore 12, Wild Turkey 101 Rye), independent releases that are still available (the Archives Aberlour and Orkney releases), and an official release that can still be found in some places in the US (the Springbank 13 Green). Lest my reputation be ruined I am going to slide in the other direction for the next few reviews. Let there be rejoicing in the land: Binny’s is shipping again! Not to every state but, fortunately for me, the list includes a neighbouring state with a border town about an hour away in which a friend works. Accordingly, I organized a group split of eight of their current handpicked single malt casks. (You can see which the others are in this month’s “Coming Soon…” post.) 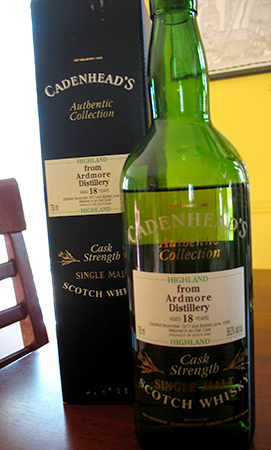 Here first is this Ardmore which is one of the casks I was most interested in. The reason for this is that there isn’t a whole lot of Ardmore about in the US—minimal official releases and very few indies—and even fewer are from single sherry casks. As such this was an unusual proposition, hard to resist (and the risk underwritten by the fact that Binny’s generally picks very good casks). Let’s see if this story of hope has a good ending. Ardmore, as you probably know, is one of the few distilleries in the Speyside known for peated malt—though it is rarely smoky to the extent of the peated Islays and others of that ilk. There’s not a lot of Ardmore available, either officially or from the indies, and so I’m always on the lookout for any new bottles. 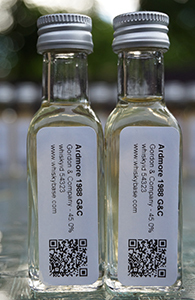 I don’t really know who Gordon & Company are; until I came across some of their bottles on Whiskybase a few months ago I had never heard of them or their “Pearls of Scotland” line which includes this Ardmore. If you know who they are or if they have any relationship to Gordon & Macphail please let me know via the comments. 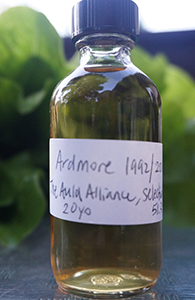 Let us take a break from Ledaig and on this day, the 4th of July, review an Ardmore. Ardmore, as you know, is what the Founding Fathers drank as they signed the Declaration of Independence. It’s a fact. This Ardmore, from a bourbon barrel, was bottled by the Whisky Agency for the Auld Alliance, a famous whisky bar in Singapore. The last time I was in Singapore I was not yet sufficiently crazy about whisky to be seeking out whisky bars, but if I make it back I certainly will try to go. This is as close as I get for now. Ardmore, located in the Highlands (as per the SWA; some still list in the Speyside), is one of a handful of distilleries outside Islay known for producing peated whisky. I’ve not had very many Ardmores but I’ve not had a bad one. There’s not very much available as official bottlings: there’s the Ardmore Traditional, which is a very good value when found in the neighbourhood of $30, but not so much when found in the neighbourhood of $50 (it depends on where in the US you are); and there’s a very expensive 30 yo–I don’t believe I’ve seen any other official bottlings in the US. But the independents, as always, do a good job of supplementing the negligence of the owners. In the last year or two, in particular, a large number of expressions from the early 1990s have come on the market and this distillery’s stock has seemed to be on the rise among the general populace of whisky geeks.